Home :: ESD / Lightning Protection :: ESP-100-POE, rugged and effective surge protectors for Ethernet based systems. The ESP Series of Surge Protectors are rugged and effective surge protectors for Ethernet based systems. They provide a high level of protection against power surges caused by lightning and other causes. These surge protectors are used to protect expensive equipment from damage caused by electrical surges. They should be mounted as close to the protected equipment as possible. The all metal cast aluminum enclosure and shielded RJ45 connectors provide for good EMI noise suppression. The integral mounting feet can be screwed to a metal chassis to provide proper grounding or as an alternative, there is an integral ground wire provided which can be connected to a ground for those systems that require a single point ground connection. They are designed to be used indoors or outdoors, if inside a waterproof enclosure. 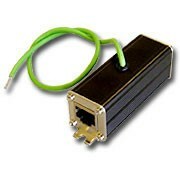 The ESP series are compatible with 100Mbps data and 12 to 48V POE systems. Protection is provided on all 8 Ethernet pins (7.5V clamping on Data pins 1,2,3,6 and 70V clamping on POE pins 4,5,7,8).